Last month I wrote a little (but long) post on the Hungry Gecko and the excellent supper club. But now the Hungry Gecko is on the road. The whole operation is being run out of ‘Barbarella’, the metal behemoth food truck which is the new home of Hungry Gecko. 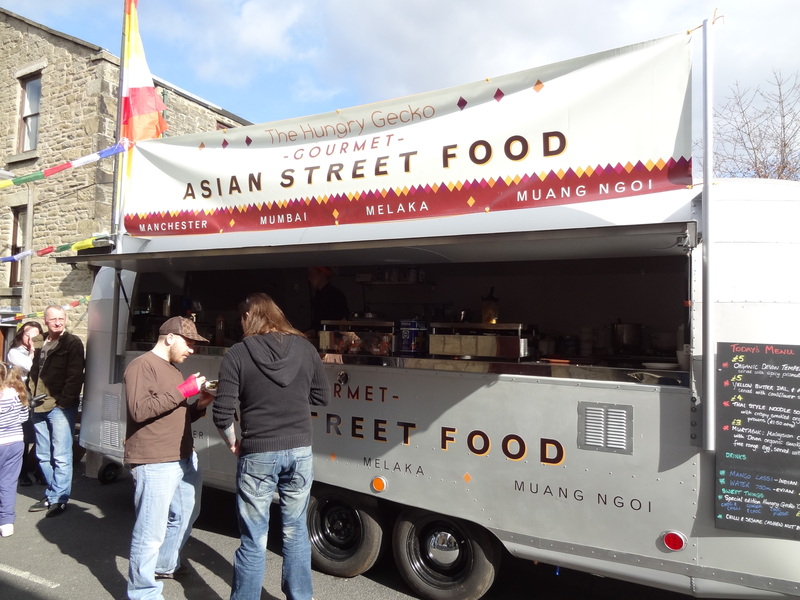 So upon hearing that some of the best asian food in Manchester was out and about, I took myself out on to the mean streets of Ramsbottom during the Chocolate Festival as I knew this was where they would be. 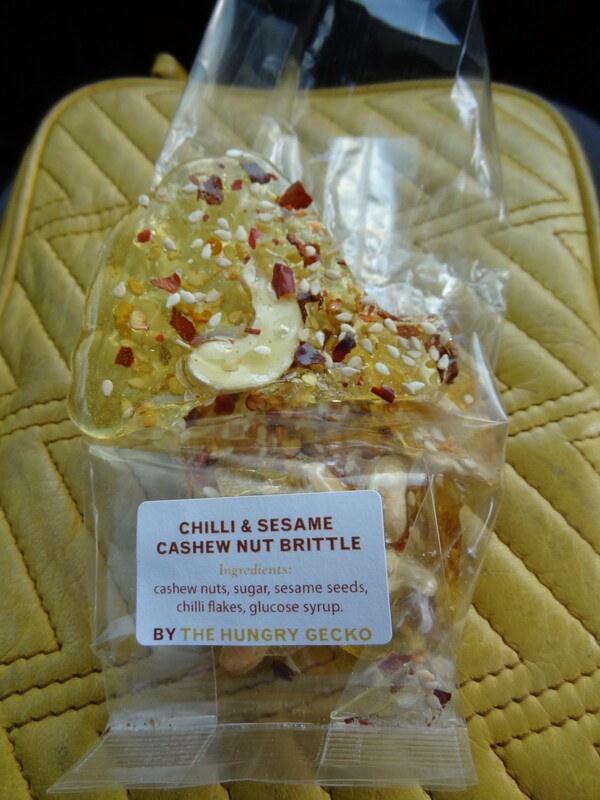 For anyone who doesn’t know what I mean by ‘they’, I’m talking about the Chilli and Sesame Cashew Nut Brittle bags. As I may have mentioned in my supper club post, I honestly love these. The sweet caramel is almost butter like thanks to the sesame but also the caramel being made beautifully thin and consistent. The chilli makes it tingle and excites the sugar flavour giving it a helping hand but it also leaves you standing there going ‘Haoaoaoa’ for about thrity second from the great afterburn when you hit a rich chilli vein. The real dishes should not be overlooked. 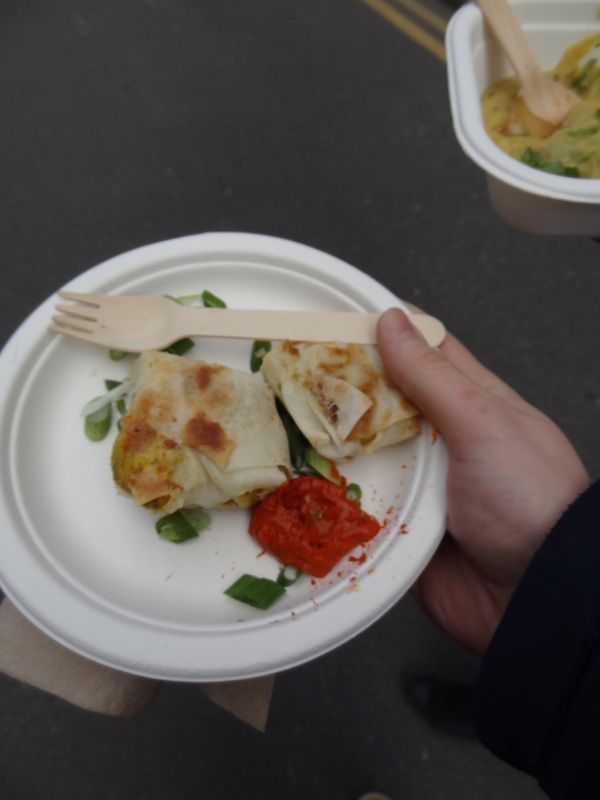 The Murtabak which is a crispy Malaysian pancake which tasted exceptional. This may have been partly because I ordered the last one and the bloke behind me sighed in disappointment, but even without the added schadenfreude, I think this is still a great snack. Light and crisp pancake, the tofu and potato giving a filling stisfaction that you want from a snack food. The flavour then jumps to another level with the hot chilli sambal, a chilli based sauce which was thick but gave a clean heat. When you mixed in some srping onion greens with this, you have a spciy tang that starts to creep up you nose in that ‘just the right side of stinging’ sort of way that spice gives you. I went through this so fast that it lasted about one minute, and that was me taking my time so I could get the full flavour. 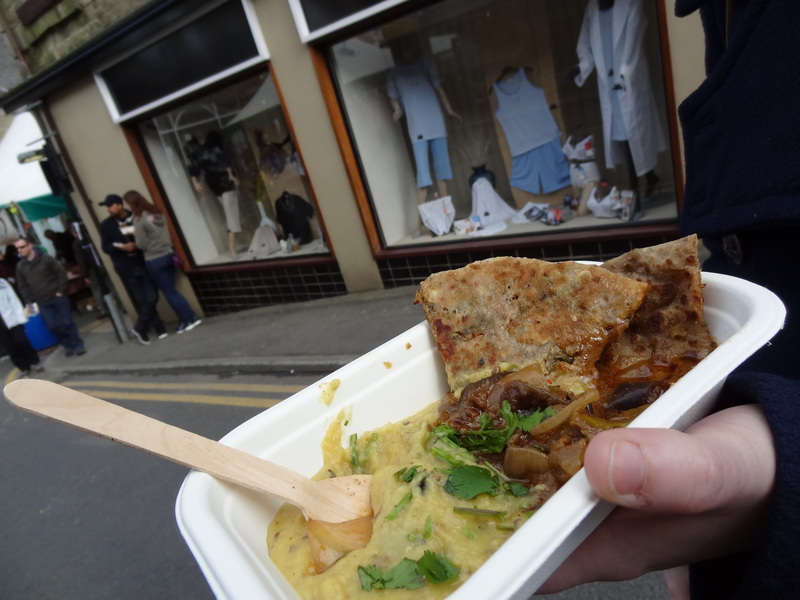 Need a dal dish that won’t give up on you, then try the yellow butter dal and aubergine masala. The dark brown bread sticking out of the corner in the picture is a cauliflour stuffed flatbread. The dal was creamy and actually put me in mind of a mildy spiced baby food. That sounds like a wierd description but it had a smooth consistency that belied a complexity of flavour underneath. It avoided the pitfall of lumpy textured dal, so I was sold. The masala provides the top notes to this dish with a mildly sweet flavour and the aubergine acting as the meaty substance. The flatbread was a bit of a bonus for this dish adding slightly salty, chewy base as well as a makeshift mop to go after any stragling dal or masala in the corners of the tub. 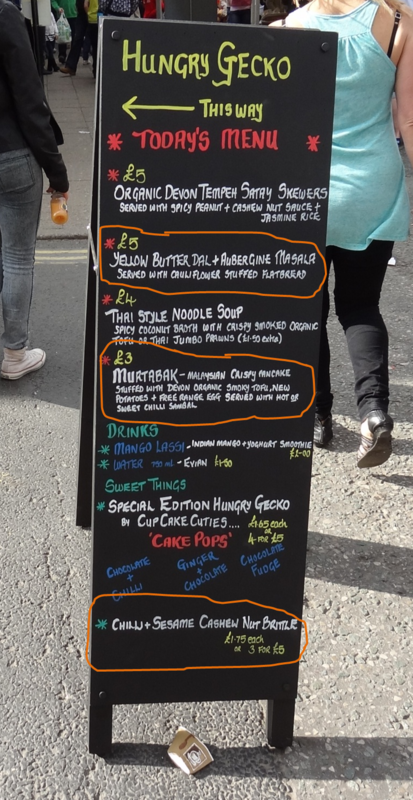 I have no concept of whether these were healthy dishes but they were really moreish and will beat a slice of pizza and a bag of chips at any festival. Hungry Gecko is now serving asian food the way it was meant to be served; fresh, hot, in a tub and ready to eat on the street. Check out the Hungry Gecko site to find out where they’re rolling to next. Ooh looks great. I’ve been after trying some of Jackie’s food for a while now. I’ll have to keep my eye out for next time she does an event round here! I had the Thai Noodle Soup. It was heavenly.